While no pharmacy director looks forward to investigating possible drug diversion, it is a critical activity in the effort to ensure medication accountability and patient safety. A robust investigative process must include the ability to mine data from automated dispensing cabinets (ADCs) and the electronic health record (EHR) in order to identify, remedy, and mitigate diversion. Concord Hospital in Concord, New Hampshire, is a charitable health system with 295 licensed beds and five centers of excellence: Center for Cardiac Care, Center for Urologic Care, Payson Center for Cancer Care, The Orthopedic Institute, and Women’s Health Services. With national accreditation from DNV Healthcare, a hospital accreditation program that integrates the CMS conditions of participation with the ISO 9001 quality management system, Concord Hospital designates the pursuit of quality as its first priority. To ensure patients receive safe, unadulterated medications, identifying and addressing diversion is intrinsic to our mission of providing quality care. These goals can only be achieved by establishing an effective diversion investigation process. Most facilities rely on reviews of ADC and EHR data to uncover discrepancies. While this data is instructive, it is interesting to note that in our experience, trusting tips from coworkers and the intuition of pharmacy and nursing leadership can also be invaluable. For example, nurses should report when they are uncomfortable with a colleague’s wasting practices, and staff can report damaged medication packaging that may indicate tampering. We take pains to communicate that simply opening a diversion investigation does not imply guilt on the part of the person being investigated. Because an accusation of diversion can potentially ruin an employee’s career, such claims should not be made lightly; therefore, strict confidentiality is maintained throughout all diversion investigations. Although stigma commonly surrounds diversion investigations, this should not be the case: The goal of such an investigation is simply to investigate anomalies in controlled substance usage and drill down to the cause of discrepancies. In order to protect the safety of patients, Concord Hospital chooses to maintain a low threshold for opening a diversion investigation. An investigation signifies our responsibility to elucidate data that will either confirm or deny diversion. In cases where poor practice is uncovered as the root cause of the discrepancy, investigations are typically completed quickly and the issue is corrected with additional training. More complex investigations require a significant commitment of both time and resources. When opening a diversion investigation, we consider the employee’s prior practice, behavior, and documentation trends, in addition to ADC and EHR data. For example, do they have a prior practice history of inaccurate documentation? Have these problems only occurred with controlled substances? It is also important to look at the person holistically; for example, are they having challenges in their personal life? If compelling evidence is uncovered, we move forward. Although the drugs most commonly at risk for diversion are controlled substances on Schedules I-V, additional drugs are also at risk for diversion—for example, propofol, gabapentin, and medications that are used to ease opioid withdrawal, such ondansetron and other antiemetics. It is important that any drug with a potential for diversion receive additional monitoring. To ensure a diversion investigation is comprehensive, a multidisciplinary approach is required. A pharmacy champion, typically the pharmacy director, medication safety officer, or a member of the pharmacy leadership team, should be the central figure when investigating suspected diversion. Patient care leadership in the impacted area should be involved. If the person being investigated is an employee, human resources should be involved; for contracted employees, relevant members of that organization should be included. Of course, hospital leadership should be part of the process as well; include the chief operating officer, chief nursing officer, vice presidents (if appropriate), as well as member(s) of the risk management department. Other potential stakeholders, including security, infection prevention, and public affairs, may be involved on a case-by-case basis. A simple truth is that if a staff member is sufficiently determined to divert, they are likely to accomplish their goal; however, robust monitoring processes serve to promptly identify the resulting discrepancies and minimize the potential for patient harm. Hospitals must balance the necessity of providing medication access to support timely patient treatment, with the implementation of tight controls and effective monitoring. For example, once a patient is discharged, the attending nurse may need to finalize waste documentation; however, ADC access for that patient should be removed within 2-4 hours to reduce opportunities for diversion. Medications that are removed after a patient is discharged should be investigated. Proactive monitoring and thorough data mining should work together to identify medication use anomalies and reduce opportunities for diversion. Thus, both routine auditing and investigation for cause are necessary. Although each diversion investigation is unique, all investigations should utilize a standard format. First, the diversion investigators are notified that there is a concern. At this point, the investigative process varies slightly depending on who or what is being investigated. If the suspected diverter is a nurse, a full activity report is run on all of that person’s ADC transactions and witnessed wastes and is compared with their medical record documentation. We then evaluate their practice administering medications. If the person being investigated is another member of the health care team, we generate as much data as possible, including all electronic records to evaluate how that team member interacts with the medications they handle. If the suspected diverted is a prescriber, we investigate their opportunities for prescribing to evaluate if their controlled substance prescribing is in line with their patient population. If a pharmacy staff member is suspected of diversion, we evaluate their interactions with medications during the dispensing process. The investigative process begins with ADC reports and EHR data, but may also include a review of video surveillance footage, which is quite extensive in the medication room and has been helpful in some diversion investigations. It is important to note that any footage must be obtained early in the investigative process, as the server may only store footage for a limited amount of time before it is erased. Having security cameras in all medication room locations and pharmacy areas is critical for investigations. Concord Hospital performs a proactive audit of controlled substance activity every month, comparing ADC activity against the medication administration record. In addition, we evaluate overall controlled substance usage on each nursing unit to identify discrepancies or unusual patterns. For example, significant spikes in controlled substance ordering should not occur except in the event of a drug shortage. In addition, we look for inconsistencies with patient care—is an extubated patient continuing to receive high dose opioids? Did the patient receive significantly more opioids on one shift compared to others without clinical justification? When auditing, it is important to understand that staff members who are diverting are often among the best documentarians, as they want to be certain to not generate inconsistencies or red flags. Thus, we have found evaluating medication consistency against the patient’s clinical picture to be quite telling. The true value of ADC and EHR data can only be realized when it is utilized to its fullest potential; this is particularly true of automated anesthesia cabinet data in the ORs. Because the OR is an area of particular concern for diversion due to its high utilization of controlled substances, implementing automated anesthesia cabinets is fundamental to proper medication management in these areas. Concord Hospital utilizes automated anesthesia cabinets throughout the ORs to properly manage and track medications in this sensitive environment. When the available data warrants further investigation, the suspected diverter is interviewed by both human resources and their department manager. A standard checklist of questions is used; however, due to the inherent variability in each situation, questions specific to the case are included as well. Standardizing the diversion investigation approach to the greatest extent possible is recommended to ensure that appropriate staff/leadership is involved and that proper actions are taken if diversion is confirmed. Therefore, developing written policies and procedures (P&Ps), which include some latitude to allow for inclusion of variances, is prudent. For example, in one nationally publicized case, an anesthesia technician diverted an injectable medication from the OR setting, which caused a Hepatitis C outbreak. In a situation involving diversion of an injectable medication, infection prevention should be included in the investigation to identify the risks specific to injectable medications. Including this information in P&Ps ensures the appropriate individuals are present and can provide follow up. Depending on the situation, employee drug testing may or may not be warranted; each organization should develop its own internal policy. Pharmacy leaders must work closely with human resources directors to ensure that they fully understand the organization’s drug testing policies. Some organizations will perform random drug testing of all employees, while others will only drug test for cause. A one-size-fits-all approach does not work for every organization, as both methods have advantages and disadvantages. P&Ps should assign responsibility for writing diversion investigation reports and reporting data to the appropriate internal and external stakeholders. Hospital leadership and risk management must be involved when reporting is required to the DEA, health and human services, the state board of pharmacy, the state board of medicine, or the state board of nursing. Both pharmacy and nursing leadership must assist in developing interdisciplinary reporting requirements. Reporting should include the information and data that can be confirmed as accurate; for example, Concord Hospital typically reports a description of the investigation and details evidence that is confirmed. The goal is to provide sufficient information to be able to make decisions related to the case, while ensuring that only credible evidence is provided. Was a significant quantity of controlled substances diverted? Are we comfortable with this individual working in another hospital? Obviously, large-scale diversion must be reported to the appropriate state boards. Moreover, numerous well-publicized instances have occurred wherein staff members who were terminated from one hospital moved on to subsequently divert at other institutions. This is clearly unacceptable. Organizations should strive to gain a thorough understanding of the serious ramifications of not reporting in these types of cases. In the past, it has not been uncommon for organizations to underreport due to fear of lawsuits or in an effort to avoid negative publicity for the hospital; however, these risks should never outweigh the substantial risk to patients when a diverter continues the behavior. In cases of confirmed diversion, each organization must develop its own approach to determining whether to offer the diverter treatment with the option of rehire pending successful completion of treatment, to offer treatment without the option of rehire, or to terminate the diverter’s employment without offering treatment. We have found that individuals experiencing traumatic personal events are more likely to divert. 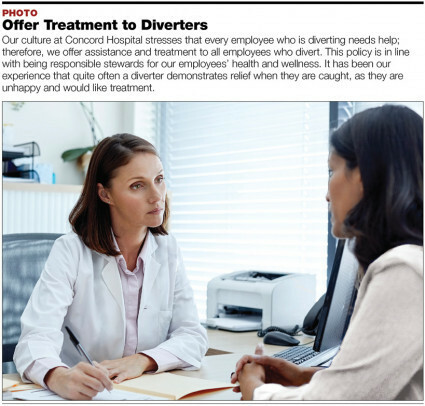 Our culture at Concord Hospital stresses that every employee who is diverting needs help; therefore, we offer assistance and treatment to all employees who divert. This policy is in line with being responsible stewards for our employees’ health and wellness. It has been our experience that quite often a diverter demonstrates relief when they are caught, as they are unhappy and would like treatment. Disciplinary actions, including termination, are considered separately from treatment and the resultant decisions are dependent on each specific situation. Investigating diversion is a challenging task that is gradually easing in its complexity as access to data increases. With the availability of ADC and EHR data, and better surveillance technology, the investigation process can be undertaken quickly and discrepancies resolved with confidence. Our growing awareness of the depth and breadth of the opioid epidemic underscores the urgency of developing the necessary practices to identify and prevent diversion. Protecting our patients means ensuring diversion is investigated thoroughly and with due haste. Elizabeth Wade, PharmD, BCPS, is the medication safety officer at Concord Hospital in Concord, New Hampshire. She received a PharmD from Northeastern University and completed a pharmacy practice residency and a medication use safety residency at The Johns Hopkins Hospital. Elizabeth served on ASHP’s Section of Inpatient Care Practitioners Section Advisory Group on Medication Safety, as a New Hampshire representative on the ASHP House of Delegates, and on the ASHP Council on Pharmacy Practice. She works closely with the Institute for Safe Medication Practices and with the ECRI Institute as a founding member of the Partnership for Health IT and Patient Safety in development of national best practice guidelines in medication safety and informatics.